Sometimes a job can hit a bump in the road over the tiniest little detail. With Vinyl Express Rogue vinyl cutters, one particular detail is essential for contour-cutting around printed graphics. Some customers find that the Rogue cuts like a champ on standard vinyl graphics, but then doesn’t contour cut properly. There’s a simple fix for this. It’s covered in part 3 and 4 of our online Rogue setup and installation video. But for those who have viewed that and want a quick fix, here’s the key to contour cutting with your Rogue vinyl cutter. Fig 1: The dialog box to install the driver’s communication port. Leave it on this selection. Fig 2: This is the window where you will the pick Vinyl Express as the brand and choose your Rogue in the model window. Fig 3. This is the solution to your problem. Select port USB_Printer_0. The first step is to make sure the USB driver has been correctly installed. If you’re not sure, here are the steps to reinstall it correctly. Tip: Make sure you download the zipped folder, extract the files. Open the folder and right-click on the driver. Select Run as Administrator. This will ensure a quick, clean installation. 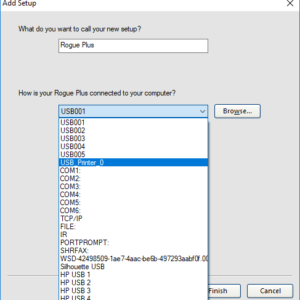 When installing the Rogue’s driver, you will see a dialog box that asks where you would like to install the driver (Fig 1 above). You may see a port setting here. The correct procedure will to leave the dialog box to the default selection and click install. Once the program installs the driver correctly, you will have a box pop up and say Install Success. Most customers navigate this well and have success cutting. The trouble experienced with contour-cutting comes from the next step. The key to success is found in the ‘Add Setup’ dialog screen in Production Manager. 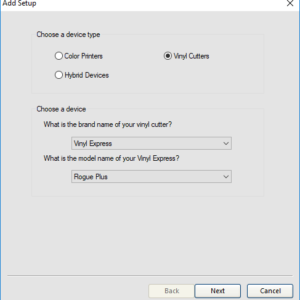 After selecting ‘Vinyl Express’ as the brand, select ‘Rogue’, ‘Rogue Plus’, or ‘Rogue Pro’, depending on the model that you have purchased (Fig 2). If you are not sure which model you purchased, there is a sticker on the left backside of the cutter. It will have a check box next to your model type. After you select the model, you will see a dialog box asking to choose the communication port for the Rogue. Here’s the most important sentence in this article. The correct choice will be ‘USB_Printer_0 (FIG 3). This option will only appear if the cutter is plugged into your PC via USB and powered on and the Rogue’s driver is correctly installed. • Is the cutter connected to the PC via USB cable? • Is the cutter turned on? • Press the Menu Key once. Does the display read “VirtualCOM N Printer Y”? When you are ready to print and cut your project, check the last tab. This tab has the registration marks and other options for the cut job. Check the drop-down menu for model. Make sure the display reads (Rogue)@USB_Printer_0. 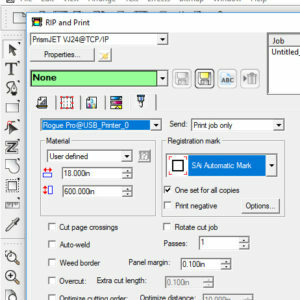 In this image, the model we are using is the Pro, so our menu says Rogue Pro@USB_Printer_0. This is the correct selection to send the contour cut job to the cutter. If the USB port is incorrect, you will have issues with contour cutting. It’s a small detail that can be overlooked. Another thing to keep in mind, if you have another USB peripheral. This includes like a desktop printer or other devices, connected to your PC, you may see USB_Printer_1, _2, etc. In this case, you may need to find the correct entry by trial-and-error. If a test job is not successful, try the next entry and send the job again. Once the correct entry is found, make a note and that will need to be the option you will need. 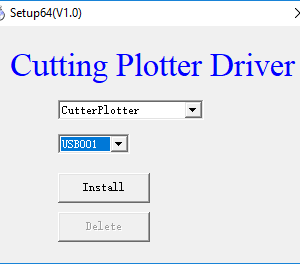 In the rip software, here is where you will need to pick where your cutter. If the correct one is not picked, it will not communicate to the cutter.